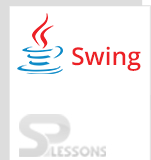 Swing Painting, Swing API provides the painting functionality to the components. Swing uses paintComponent() to paint the components, 2D and 3D type of graphics will use the Swing Painting, machines will have two types of graphical representations such as pixel images called as Raster graphics and points, lines called as Vector graphics. Vector graphics are more efficient when compared to Raster graphics i.e these will be in smaller size and consists of ability to zoom properly and even rotating, moving the effective of the image will not be changed. The example of 2D graphics as explained in below example. The functioning of 2D graphics has been explained in the following example. // GradientPaint to paint the entire background. // Use GradientPaint to draw a box. // This one alternates between deep opaque green and transparent green. // any other shape. Here we get some letter shapes to draw. // combines features of both Paint classes. GradientPaint to paint the entire background.Background color varies diagonally from deep red to pale blue. Use GradientPaint to draw a box. The glyphs of fonts can be used as Shape objects, which enables us to use Java2D techniques with letters Just as we would with any other shape. Here we get some letter shapes to draw. Outline the letters with a 5-pixel wide line. Combines features of both Paint classes. If above code executed successfully,output will be as follows. Displaying the image is the good feature provided by the Swing API and pixels of an array is called image ,these pixels indicates colors at different levels.The flow of image code as shown follows. SwingUtilities.invokeLater(new Runnable() //The invokeLater() method places the application on the Swing Event Queue. It is used to ensure that all UI updates are concurrency-safe. Create image loading method and create dimensions such as height, width of and image. Dimension dm = new Dimension(img.getWidth(null), img.getHeight(null));//to set the image height and width. Set the path to load an image into the imageload() method. 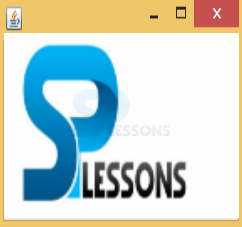 If above code executed successfully, output will be as follows.Where imported path of an image of the SPlessons logo. Swing Painting – JLabel is one of the efficient component to display the image. Swing Painting – DrawImage () method will be use full in swing painting to draw the image. Swing Painting – JPanel gives minimum use full requirements to the components which are light weight.